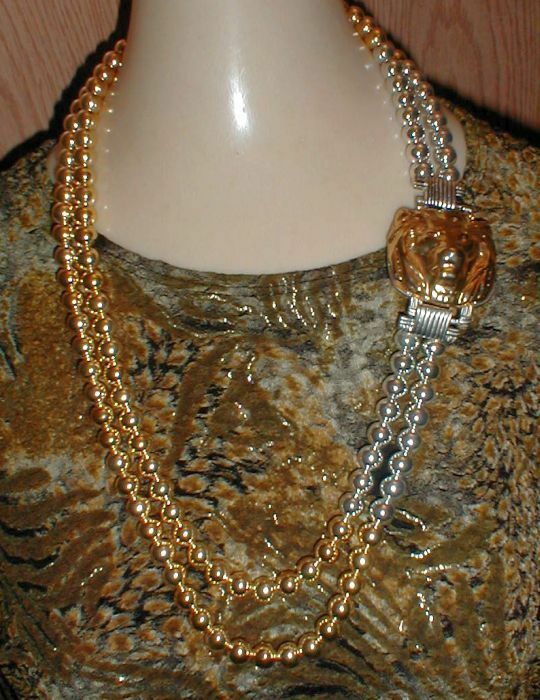 A magnificent classic Roman lion head highlights this double-row gold and silverplated beaded necklace. 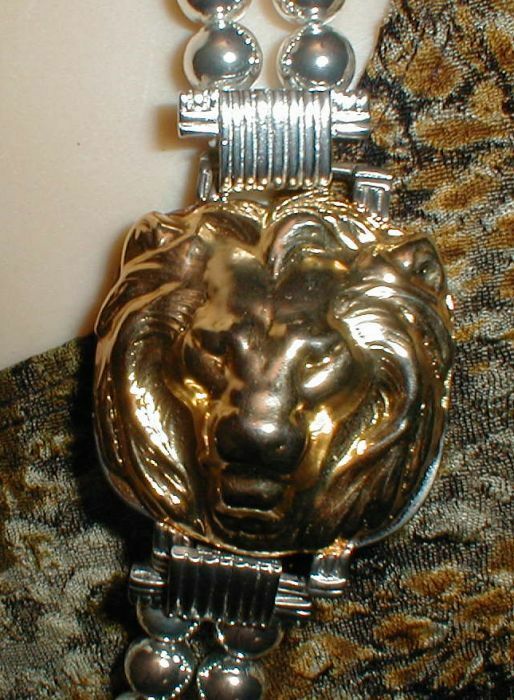 The lion head covers the hook clasp. View closeup of lion head clasp here. Necklace is lighter than it looks. Uncirculated, new condition. Sizes: Lion Head, 1 3/4" W x 2" H. Beads: 28" L approx. Graduated highly polished very good weight silverplated brass beads say sterling silver but you don't have to pay a sterling price. Size: Neck length approx. 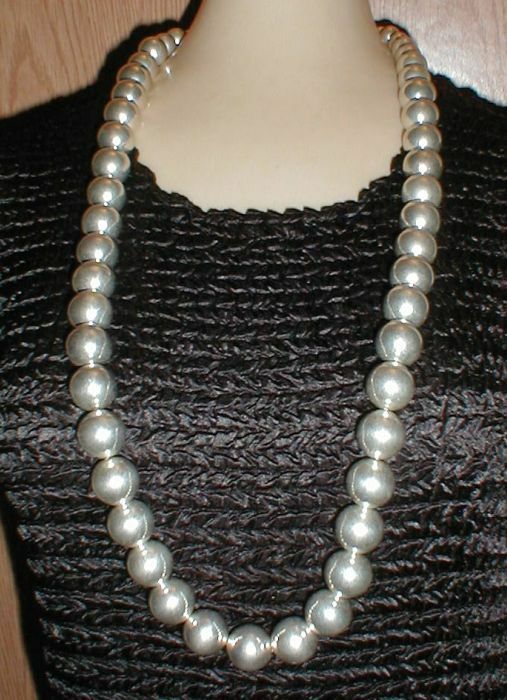 36", largest beads 20 mm approx. at center, graduated to 8 mm smallest. Easy secure wide push-in clasp. Uncirculated, new condition. 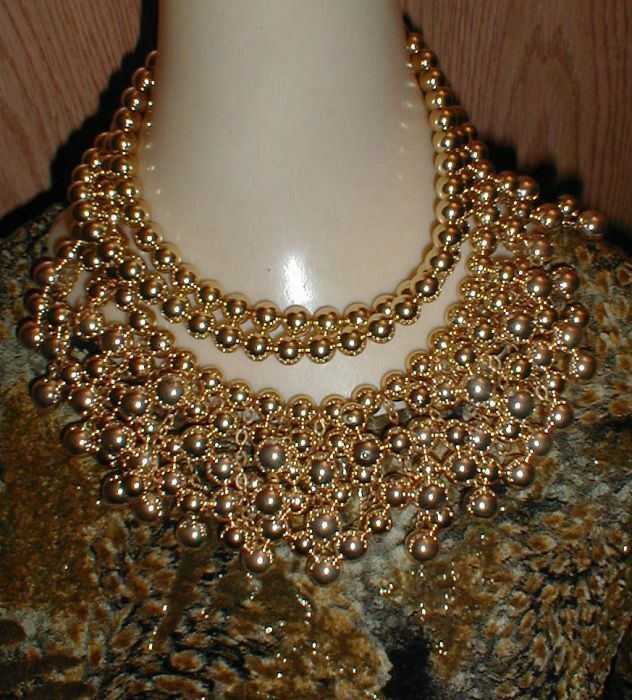 Big grape clusters drape the front of this long goldplated bead necklace which can be worn as shown or draped just once or twice around the neck with the handy secure clasp. Uncirculated, new condition. Size: Neck length approx. 44", Cluster drops approx. 2 1/2". Beads, 10 mm. 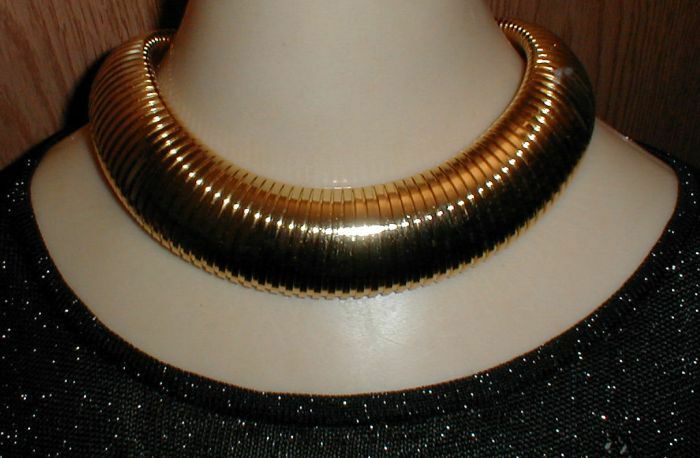 Just as it was first introduced in the 1940's, this coil collar is still a favorite, here in a 1980's version. Flat back, articulated, easy push-in invisible clasp. Uncirculated, new condition. Matching three-row pull-on bracelet available below. Size: Neck length 19", Width: 1 1/4". Unmarked Kenneth Lane, compare matching bracelet here. 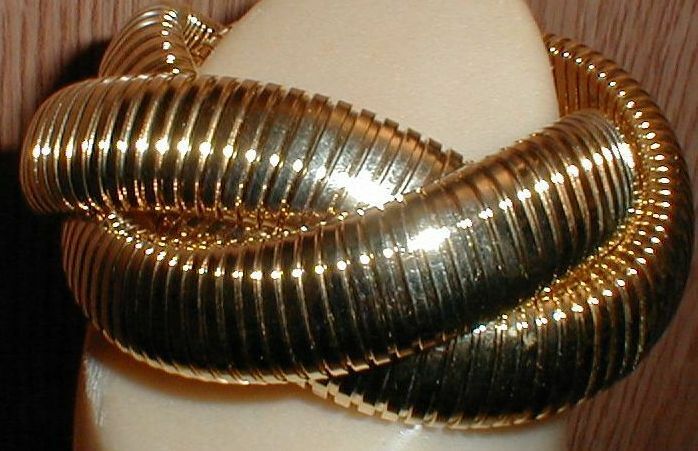 Comfortable three-row pull-on bracelet matches the Snake Coil Collar shown above. Uncirculated, new condition. Size: Medium, slightly elastic, Width: Each row 5/8", total 1 1/2" approx. Unmarked Kenneth Lane, compare here.